With deep grief and disbelief, we watched the fire that devastated Notre-Dame cathedral on Monday night. Thankfully Paris’s brave firefighters were able to extinguish the flames and save the structure from complete destruction. We are heartbroken. But we have faith that Notre-Dame will be rebuilt, just as President Emmanuel Macron has vowed. International fundraising campaigns have already been announced. 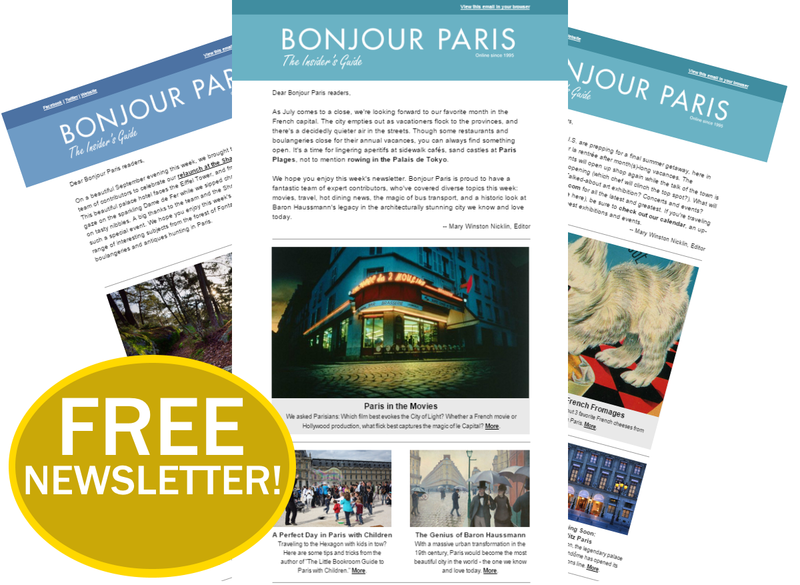 “A few years ago I had the precious opportunity to spend a few days in an apartment on the Seine. The building dated from the 16th century and had enormous wood beams with gigantic nails piercing through. But the most treasured part was the view. I snapped this picture (below) at one of the front windows. This is what the owners see every day as they move about their space. Notre Dame Cathedral is more than a place of worship. It is the marker of a civilization. The pain of seeing this monument burning also symbolizes a civilization in flames. Notre Dame has a deep and powerful affect on people. That is why the agony of seeing her burn is so universal. Culture and the monuments they leave behind provide us with more than awesome beauty; they give us a sense of solidity, of place and time; of where we have been, who we are, and where we may be going. “Sometimes, when you walk by a place often, it can become just a blur of background scenery. Not so with Notre-Dame. I pass it every day on my way home to the Ile St Louis. It has never—ever— been just part of the scenery. I always pause—to look again. Inspired by its grandeur. 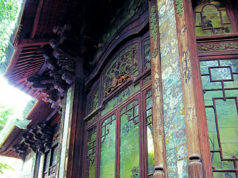 The articulated carving. The ingenuity of flying buttresses. Its reflections on the nighttime Seine. The rose windows, beautiful from inside and out. 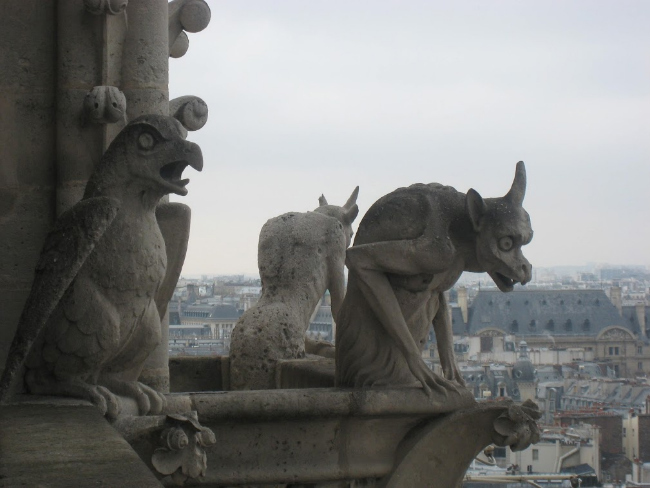 The wild and weird gargoyles. The sound of its bells. Its place in history. 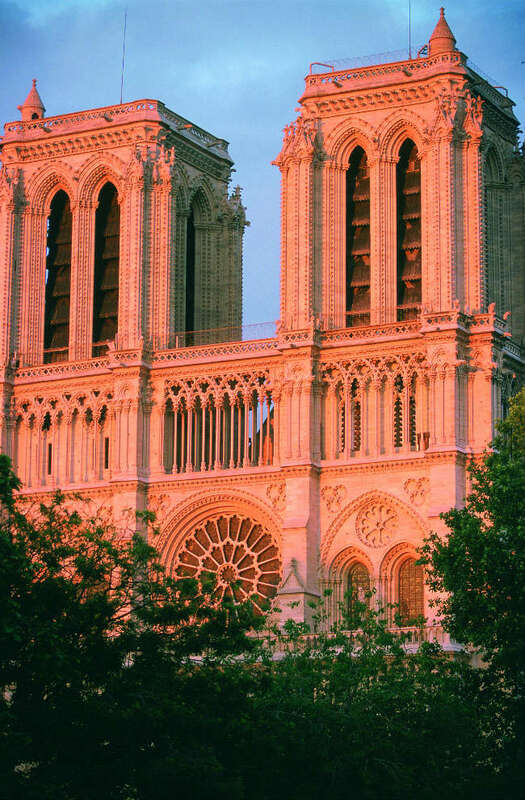 “I grew up with an etching of the Notre-Dame on my polka-dotted kitchen wall. It was a gift from my cousin Linda. At the time, she was an exchange student in Paris. Immediately after my dad’s installation, I was smitten. Bill B. was a big believer in the Clean Plate Club, so this Francophile in the making and the souvenir artwork spent many an overextended dinner alone together—especially during brussels sprouts nights. I’m still smitten. Did you know the bells have names? So, today, after riding the non-stop wave of tears, I reached for my well-loved copy of Victor Hugo’s Notre Dame de Paris. You see, we have writer and historic preservation activist Victor Hugo to thank for jump-starting a sightseeing frenzy, along with the much-needed renovation that followed the publication of his very first novel, Notre-Dame de Paris, in 1831 (released in English in 1833 as The Hunchback of Notre Dame, much to the author’s dismay). 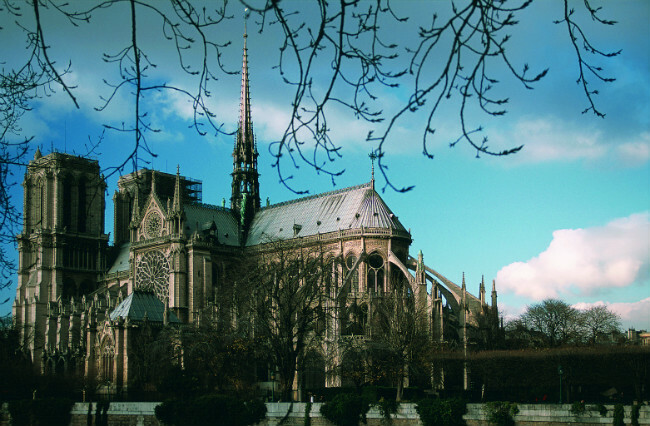 Without a doubt the Cathedral of Notre-Dame is, even today, a majestic and sublime edifice. Though it has preserved a noble mien in aging, it is difficult to suppress feelings of sorrow and indignation at the countless injuries and mutilations which time and man have wrought upon this venerable monument between the time of Charlemagne, who laid its first stone, and that of Phillip-Augustus, who laid its last. On the face of this old queen of French cathedrals, beside each wrinkle you also find a scar. According to recent news reports, the twin bell towers and the Portal of Judgment on the Western façade appeared to have been saved. Today I’m thinking of the fire fighters. Thank you. Our absolutely fabulous queen, Notre Dame, will survive. “Watching this evening the unbelievable footage of Notre-Dame in flames has left me drained and heartsick. 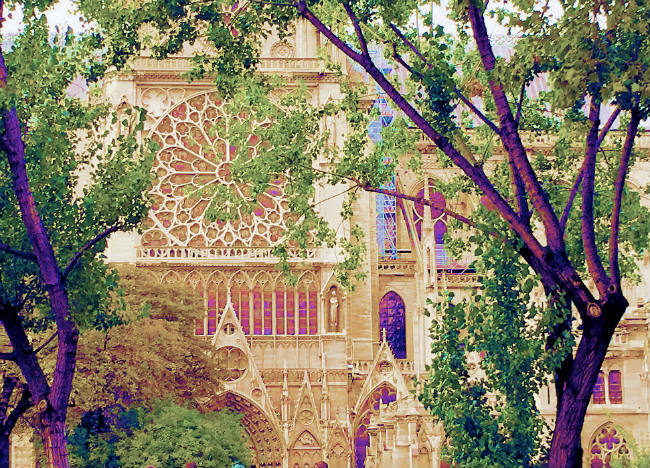 Six months ago I was sitting reading in the gardens of Notre-Dame and even after more than 50 years of seeing her, walking past and visiting her on a regular basis, I still knew absolutely at that moment how lucky I was to be sitting there in her shadow. I am not religious. Notre-Dame’s beauty and spirituality move me anyway. Two years ago I was witness to the Easter mass. I am so glad now that I went if even just as a spectator. Like anyone who has ever visited or lived in Paris, I have photos of Notre-Dame from every angle in every light in every season. She was impossible not to capture in film again and again compulsively. 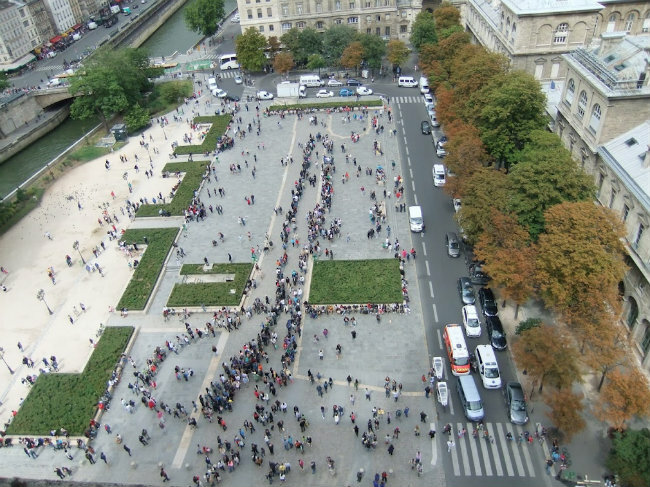 “I started to cry when I saw the subdued crowd of Parisians jointly singing Je vous salue Marie. An ancient prayer for an ancient church. 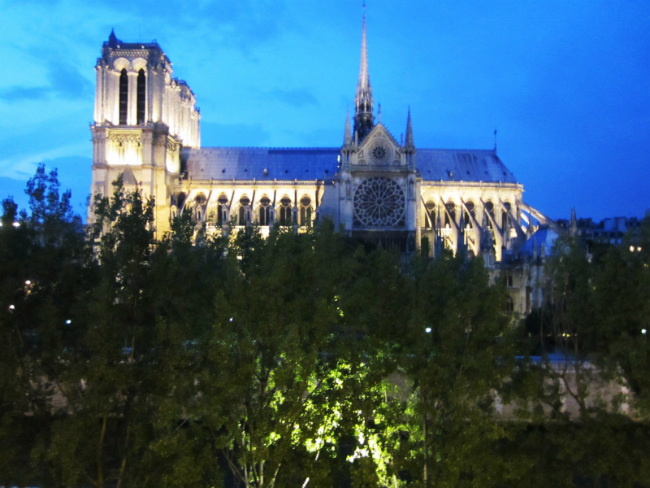 Notre-Dame de Paris is the city’s center – Paris’s raison d’être – or a least one of my reasons for returning to Paris. For me, Notre-Dame encapsulates the awe I felt for the entire city as a 20-something visiting Paris for the first time. As a young mother, I introduced my son to the magnificent lady from the deck of a bateau-mouche. 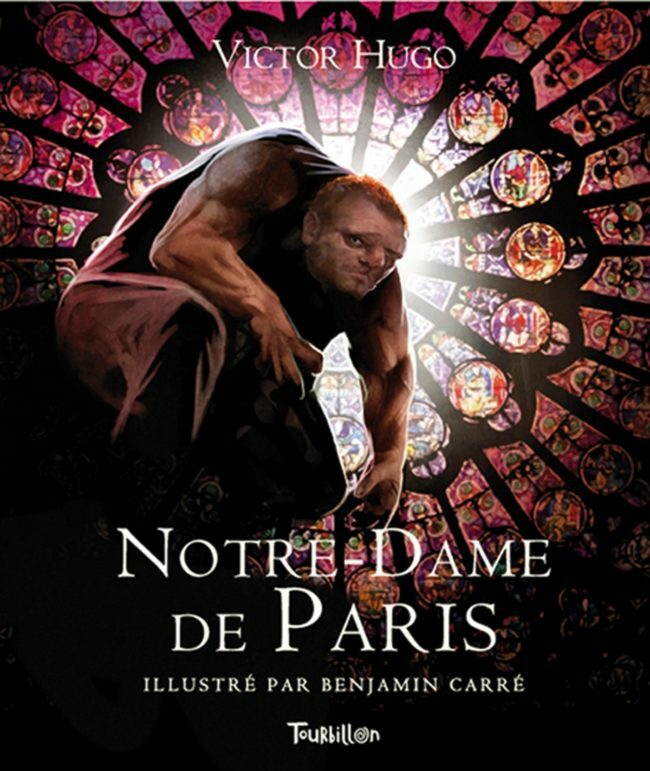 In more recent years, Notre-Dame de Paris has been alongside me in my studies of Napoleon Bonaparte, Victor Hugo and of course the architecture of the Gothic cathedral. Most recently in the autumn of 2018, the gardens at Notre-Dame were a quiet place where a weary solo traveler could rest her feet like so many pilgrims before her. Ironically, Notre-Dame survived the desecration of the French Revolution and is in no small part the reason for the fragile truce that spared Paris during the Second World War. As her 21st-century caretakers, we have let her down. “Notre Dame, 1960. When I was 16 years old, my father introduced me to my first Cathedral, complete with Gothic architecture, a rose window sparkling in the June sunlight, and my own wonder that such a structure could have been constructed during what I had studied in high school as “The Middle Ages”. The sacrifices to build it, the comfort brought to people by a place of such beauty; it stood as a testimonial to hope and transcendence. 1963. When a student at the Sorbonne, I would cross Pont St. Michel following classes, enter the sacred space – no lines back then – and sit mesmerized by the Latin mass, the sounds and intonation, the incense, the ritual, all bringing solace to this homeless Jewish American college soon-to-be-senior, who felt embraced by dignity, predictability, and compassion as I sat inside the Cathedral’s stones. 1996. 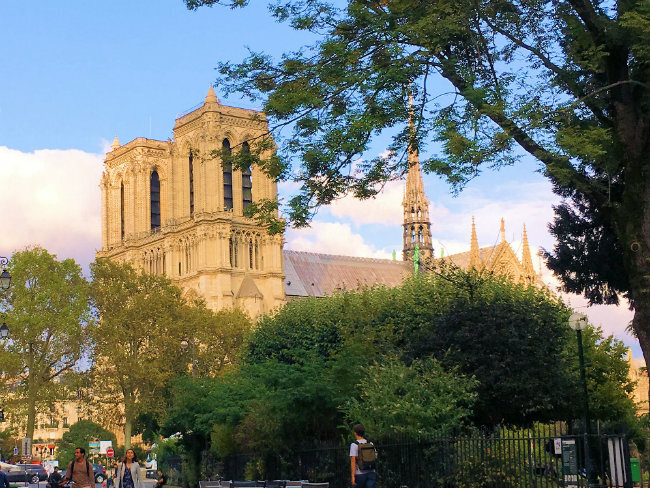 On my return to Paris, Notre-Dame greeted me like an old friend, her marker for 0 kilometers – the center of the city – sitting proudly on her esplanade. The following summer, as we drove my lover and future husband’s converted barge upstream, along her southern walls, I gasped at the Cathedral’s endurance, angles, evolution, each facet offering a story of creativity, dedication, evolution and inspiration. 1998. Living in Paris, I found that the Latin mass I had learned to love was still being recited at Notre-Dame. Like the Hebrew of the Jewish prayers of my childhood, the ancient language carried me mystically to a place of broader perspective. 2011. When we brought our oldest grandchild to Paris, days following her twelfth birthday and the death of her beloved Opah, she found meaning in lighting candles in his memory after choosing her favorite chapel to place for them. Only after did we climb the towers. 2013. 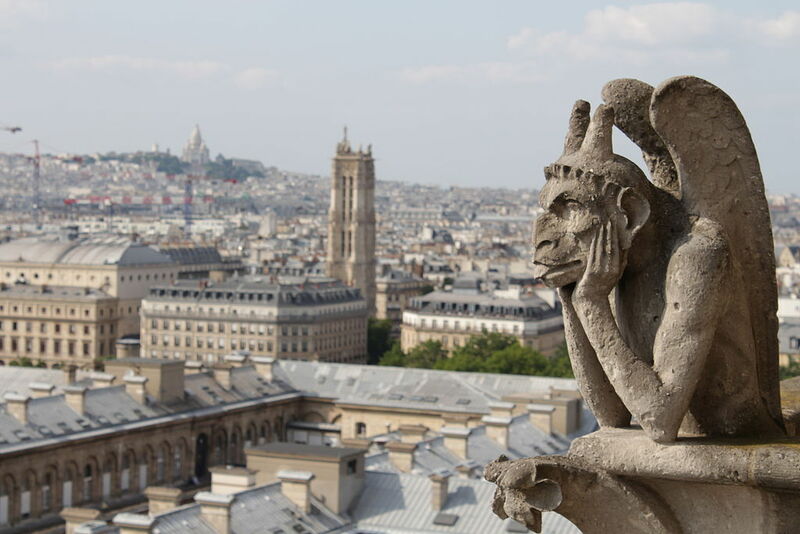 Her brother loved mimicking the protective gargoyles as we made our way across the Towers. 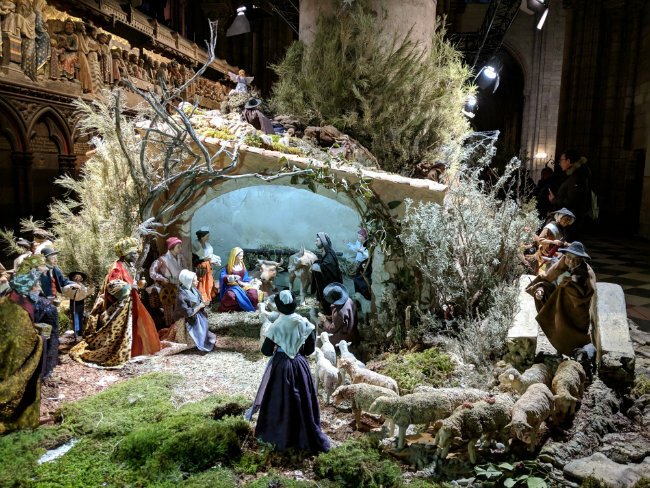 He marveled at the lines of tourists queued for entry into the Cathedral, at the rooftops stretching across the Latin quarter, at the gardens with their footbridge across to the Ile Saint Louis. I share all of the above tributes and note one peculiar link we all share: we took it personally! The collective heartache brought on by the fire united us in grief. 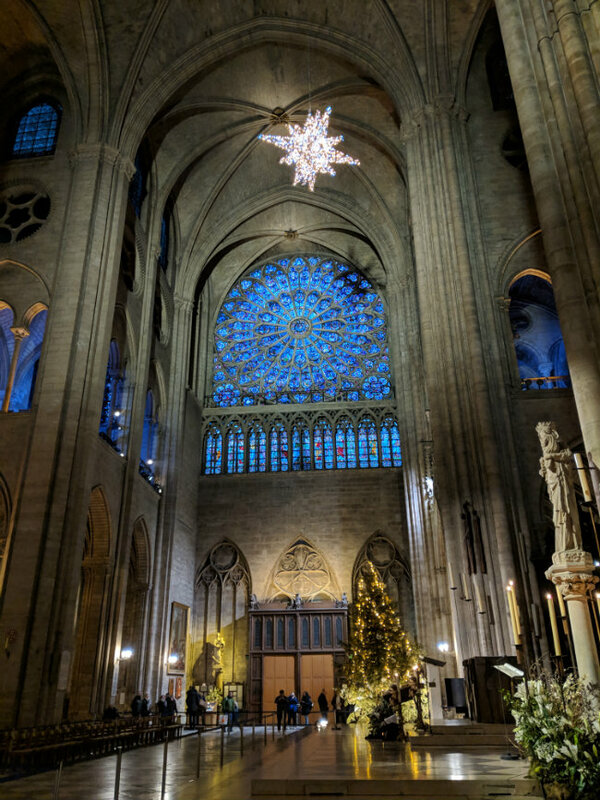 My personal attachment to Notre-Dame comes from several sources: First: I am Catholic, so the cathedral was a place of pilgrimage. Second: Like so many people I am awed by the majesty of Gothic architecture, which I learned to appreciate in courses of Art History in college. Third: I was brought up at a French school (Sacre-Coeur de Jesus, or the Sacred Heart, founded by Sainte Madeleine Sophie Barat). Finally I am a History and French major. From the beginning French culture was an integral part of my upbringing and education. Hardly surprising then, that upon returning to Paris after seventeen years of absence it was the first site I visited. It was an emotional encounter. 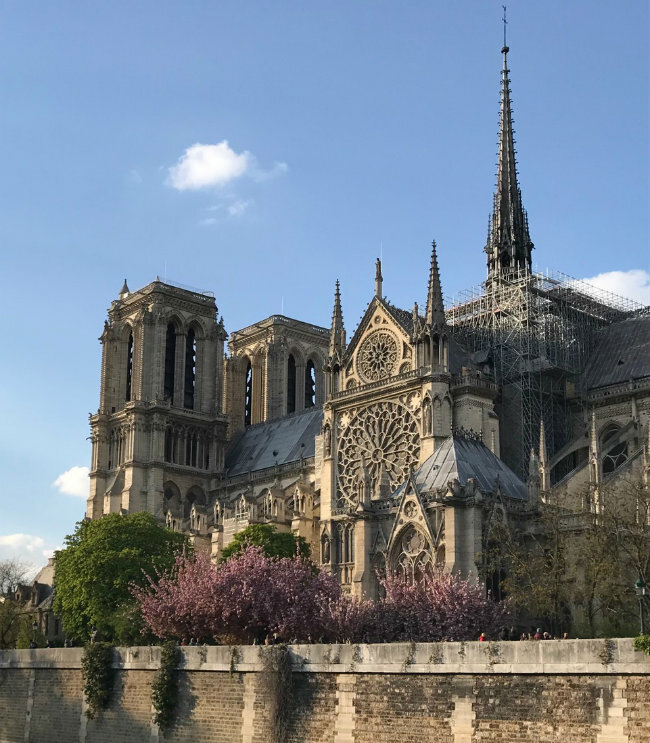 As I spotted its imposing facade I said to myself: “Nice to see you again, my beauty.” We all feel that way: Notre Dame is not just a French or European cathedral; it is ours. Most definitely. It was a rainy April day–that day in 1958 when I visited Paris my first time. The start of a two and a half years visit. After strolling the Champs-Élysées and a short visit to the Louvre, my final adventure was another famous site–Notre Dame Cathedral. Its steeples became visible as I approached the bridge over half of the River Seine–the river’s other half flows on the other side of the island. That it was on an island (“Île de la Cité”) was another revelation. Overcome by its beauty and size–I had never seen nor been in such a magnificent place of religious worship. Its darkness added to its mystery. In order to take in all in, I sat a long time under the huge, beautiful rose window–absorbing the cathedral’s impressiveness. (It was only on a later sunny visit that I really appreciated what a spectacular work of art that rose window truly is.) 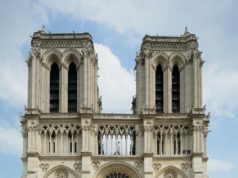 Over the years, I’ve visited Notre Dame many times–even climbing one of the bell towers for a spectacular view of Paris. And I learned something else on that first visit; touring churches and cathedrals yield wonderful architecture, interesting statues, beautiful paintings, and inspiring religious artifacts. Like Meredith Mullins, for many years I lived on Ile St Louis and would walk past Notre Dame several times a week, as it was en route to most of the rest of Paris. 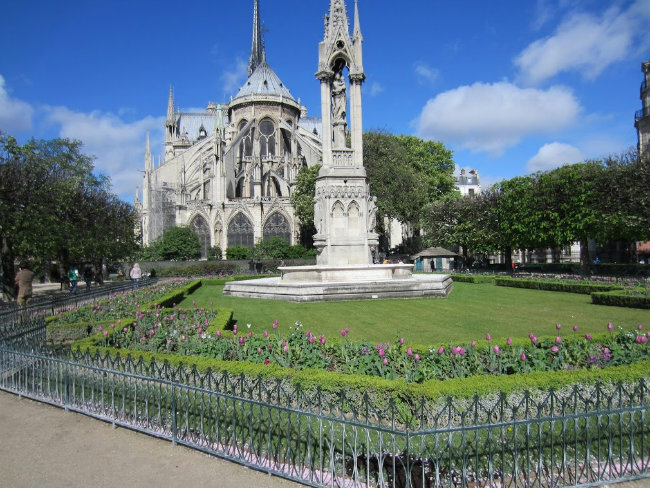 The walking route was across the pedestrian Pont St Louis where one got the best view of the church, across the gardens of its Square Jean XXIII to its flying buttresses and the spire (a relative young addition in the 1830 renovation). The view from the Parvis at the front is not bad either! In fact I always recommend to visitors that at Charles de Gaulle airport they must take the RER-B train and alight at station St-Michel-Notre-Dame; either exit to the street is fine but I think the one at the Petite Pont is especially impressive, even more so at nighttime, with its perspective across the Seine and the two towers dominating the skyline. Doesn’t get much more evocative or Parisian! 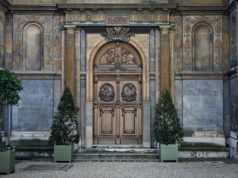 It is simply your perfect entrance to Paris. 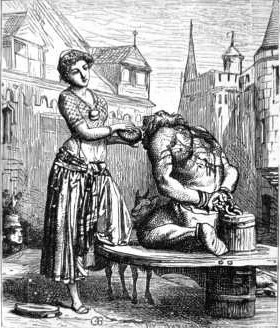 Being atheist I don’t revere it for any contemporary religious significance while acknowledging its role in the history of France. Indeed, I am reassured that, unlike most other such edifices in other countries, it remains the property, not of the Church of Rome (or its local branches), but of all the people of France under the guardianship of the government (legally since 1905). And in the spirit of Jefferson (who borrowed the notion from Henri de Bornier) the rest of us too: “Every man should have two countries: his own and France. The Catholic Church is a mere tenant of the building. To me, this actually gives it added historical resonance and validity as a symbol of Paris and France, and progress. Just to think of its history across the past two centuries (even without the prior 600+ years) is enough to leave one breathless: the revolution, the 1830s renovation (provoked by Hugo), the further endangerment during the 1871 Commune and two world wars. Indeed I believe this republicanism and anti-clericism lies at the reason why successive governments, including Macron’s, has resisted applying an entry fee on those 12 million visitors each year, tempting as it must be. More than any other church, probably in the world not exempting St Peters, it somehow belongs to everyone. Paradoxically though, the proposed entry fee might have forestalled this near-cataclysmic event because the overwhelming reason for the delays in its renovation (a constant topic even when I first visited Paris almost 40 years ago) and the recent rather half-hearted attempts (all that scaffolding around the spire) that seem likely to have been the cause of the fire which originated in the spire. 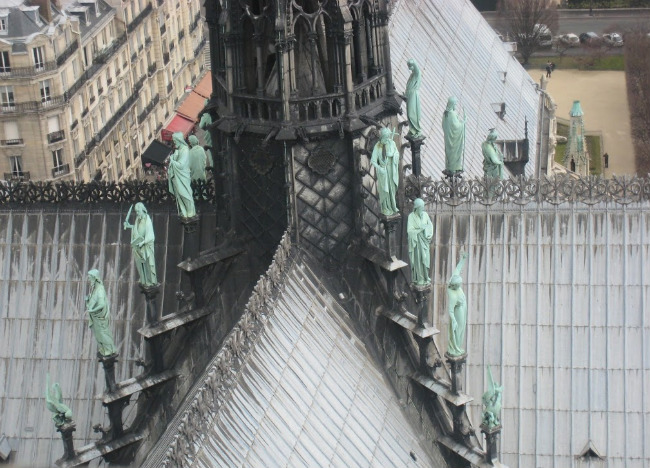 But never mind, it has clearly survived and with less damage than feared–though the history of Gothic cathedrals shows many similar accidents and recoveries, and it seems their very design tends to save the structural fabric from severe damage when their roof collapses (eg. Rheims also restored by Viollet-le-Duc who last renovated ND de Paris; York Minster is another). The heavy stone walls with their flying buttresses and stone vaulting act as a very strong exoskeleton, and as some experts have pointed out, being very early Gothic means more massive stonework than late Gothic, so making Notre Dame one of the most robust of its type. I believe there was unnecessary hand-wringing by assorted experts and commentators in the immediate aftermath. This risked the restoration project getting bogged down in endless and over-cautious delay amid expertitis and managerialism, with wild talk of billions of dollars and decades of work. I am reminded of the Louvre “renovation” that began with Mitterand’s decision in 1983, followed by a world competition won by I.M. Pei and its deep excavation works (uncovering at least one thousand years of history and all the archeological investigation and potential for delay; there was a public walkway to look down into the vast site which I did many times), yet it opened to the public in late 1989. So a mere 6 years in what was a much bigger and arguably more complex project than putting a new roof on Notre Dame. So yes, clearly it can be done. Other than the seeming structural integrity of the stone core of the building, the reconstruction of the roof should be greatly aided by Andrew Tallon’s digital map. Alas, Tallon died young last year from cancer but his exhaustive laser mapping of interiors and exteriors should mean no great delay or equivocation on what to rebuild. His work was the subject of a tv documentary that I saw a few years ago, and apparently there is a version on YouTube. I believe President Macron’s announcement to restore it on a five year timetable was the correct decision, and with goodwill should rescue it from the curse of so many similar ill-fated projects that seem to drag on forever and cost a fortune. The deadline happens to coincide roughly with the Paris Olympics in 2024 so it is logical and fortuitous. If it slips a bit, well no biggie, but vastly better to have a deadline to work towards than be open-ended and uncertain. Perhaps it needed the authority of the president to bring everyone onto the same page: let’s get this restored without unnecessary delay or angst. 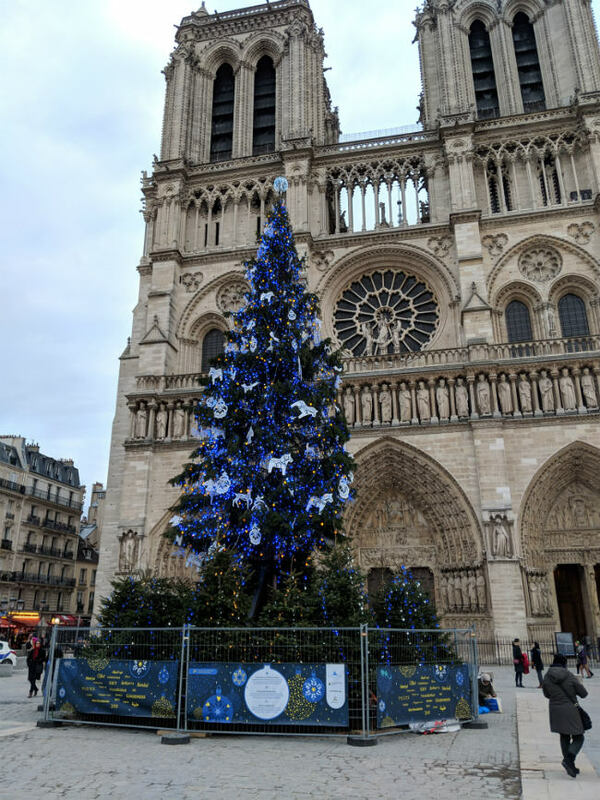 We were so saddened to see the damage done to the beautiful iconic Notre Dame. Gratefully we were able to pay a visit this last October. We will be back, and look forward to rebuilding of this beauty. A sad day from Francophiles the world over. When my husband was an art student in Paris, he did a pen-and-ink sketch of Notre Dame Cathedral — the spire rising above the towers, the flying buttesses in the foreground. Whenever we are there, we stand on the banks of the Seine, in the same spot he had stood as he drew, and watch his sketch come to life. That’s how I will always remember it.